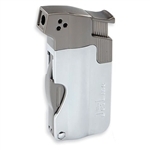 Rikang Table Torch Lighter - Silver. 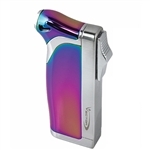 This table lighter has the ability to have a torch or soft flame which burns at 1300c. Piezo electric ignition for a trouble free easy start. This is a great item for hobbyist building or soldering projects with the ability to swivel for the perfect angle. Great for the outdoors man in everyday use or emergency. As for the smoker it will light your cigar without tainting the taste of the tobacco like a fluid lighter will. It also is convenient to pass around to others while the flame is still lit. 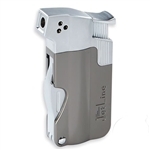 With the turn of a slider it will work great for pipe smokers as well changing from a torch to a soft flame. All of our lighters are emptied of fuel to save on shipping costs.